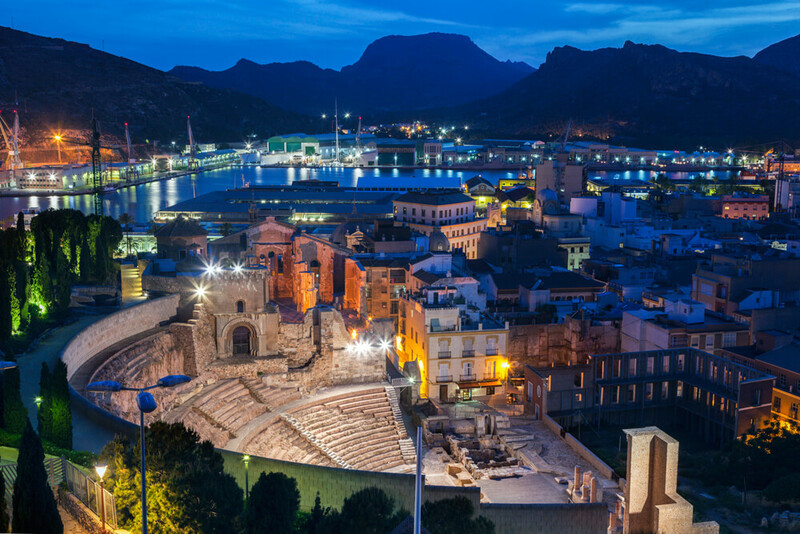 When you purchase one of our beautiful properties in Cabo de Palos, you’re just a short drive away from the charming, historic city of Cartagena and its iconic Roman theater. It’s a fascinating and atmospheric place to visit, attracting tourists and locals alike to soak up the authentic feeling of an old Roman town. Cartagena can lay claim to more than 3,000 years of history and has much to offer. It’s the perfect place to wander the streets, do some sightseeing and then treat yourself to local delicacies like the famous caldero dish or an ‘asiatico’ coffee with a tocino de cielo dessert. Around every corner, you’ll find a monument, historic building or a view worthy of a postcard. Founded in 227 BC, you can discover more about the city’s impressive past in the Visitor Activity Centre. There are lots of interesting places to visit like the Underwater Archeology National Museum and the Roman Forum district. But the Roman Theater truly is the jewel in the crown of the whole city. The Roman Theater of Cartagena is one of the most well-preserved and impressive relics of Roman architecture that exist today. First built between 5 and 1 BC, it has had many transformations over the years: From a theater, to a market, to a cathedral, before finally being restored to its original splendour. You will be amazed by the majesty and beauty of the theater. You’ll feel like you’ve been swept back millennia to the day of the Romans. It’s easy to imagine what the theater would have been like in it’s heyday. Set on top of one of the highest hills of the city, it truly is a breath-taking monument. The Roman Theater of Cartagena has undergone a full restoration, completed in 2003. In 2008, an accompanying museum was opened at the site to give you even better insights into the history of the Theater. You can walk the aisles of the theater, sit where the audience would have been captivated over 2,000 years ago, and imagine the dramas that would have unrolled before their eyes. Our stunning properties are found in the perfect location. Not only are they within sight of the beautiful Murcian coast and gorgeous beaches. You’re just a short drive from historic, fascinating places like Cartagena and its authentic Roman theater. Explore, wander around the streets, grab a delicious lunch and then home for a relaxed evening at your luxury Las Camelias apartment.